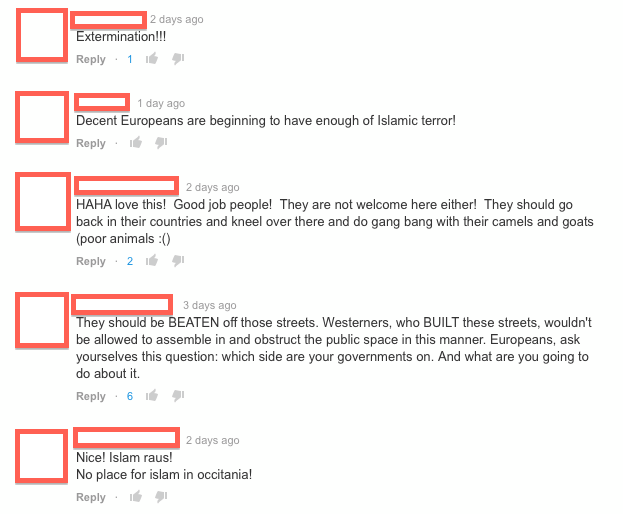 Yesterday’s post about the Monchengladbach anti Islam prayer on the street had a YouTube video of the people praying and those loudly objecting to this, a quick look on the comments of this short video reveals a scary image of an aggressive society that has nothing but contempt and violence towards others. Some make threats, others add two-three words comments like “Hitler was right” (about what? praying on the streets? anti Islam?) and others get into a heated and ugly discussions about how “Muslims” will be pushed out, kicked out or just “exterminate” – but who do they mean? those born to two Muslims? those who are practicing Muslims? those with even a small hint of Islamic blood? Others dive head on into the simple “kill them all” argument, going on against Jews (completely off topic, but hey, as long as we are being racists we should push everything through the door) and illuminati and others. How depressing to see a valid secular issue being degraded to this filth, and to witness the same level of violent aggression so easily flow out of all sides of this argument.